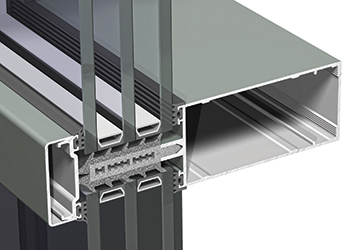 Reynaers Aluminium says new extensions to its Curtain Wall 50 (CW 50) system for facades and roofs offer innovative solutions for higher glass weights, easy assembly and quick installation, as well as improved energy efficiency and sophisticated connections of profiles. They provide maximum natural light and thermal performance for ultimate design using sophisticated connections, according to the Belgian aluminium systems provider. “These solutions stand for excellence and ultimate design applications within this proven curtain-wall system,” says Ali Khalaf, managing director of Reynaers Middle East, the regional office of Reynaers Aluminium. The Curtain Wall 50 system offers unlimited design freedom and allows maximum transparency and superb thermal efficiency, he adds. Available in several design and glazing variants, the CW 50 also includes different technical variants to comply with specified levels of fire-resistance and thermal insulation. A second extension to the CW 50 system makes the system perfectly suited for much larger glass panes and for the use of triple glazing, he says. The maximum glass thickness can measure up to 61 mm and the system can carry a maximum weight of 700 kg, thanks to a special glass support. With this addition in the CW 50 system, specific bespoke solutions are no longer required for such extra-large glass panels, Khalaf points out. The high insulation (HI) variant of CW 50 makes use of improved insulation profiles, resulting in an insulation value (Uf) down to 0.56 W per sq m K with a glass thickness of 60 mm (Previously, this was 0.73 W per sq m K, while for the standard CW 50 system an Uf value of 1.7 W per sq m K applies). An additional advantage of this new CW 50-HI system is the ease of production and installation. The insulation foam profiles consist of hard and soft elements. The soft element is pre-cut, so that drainage channels can be incorporated in a simple manner. The hard element offers ideal guidance for the screws. Lastly, the installation is made even more convenient due to the fact that the glass no longer has to be taped using waterproof tape, yet it can offer an ultimate air- and water-tightness level up to 1,950 Pa, he adds. 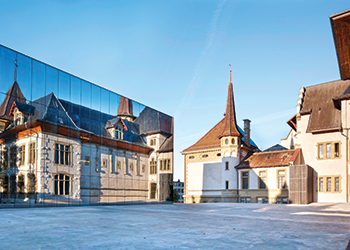 The Bern Historical Museum in Switzerland ... CW-50 installed. 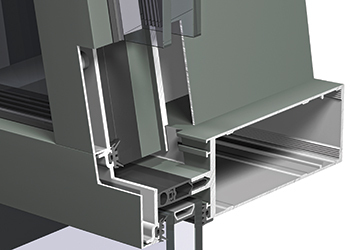 As a final innovation, CW 50-TT (transom-transom) makes facade construction even easier. This extension ensures that the facade can be constructed with a single profile, without complex operations. Various opening types can be seamlessly integrated within the CW 50. These include the top hung window (THW), parallel opening windows (POW), hidden vent turn and tilt windows (HV-TUTI) and flush roof vents (FRV). Several aesthetical connection profiles allow a concealed integration of other Reynaers window and door systems as well.